KVPY 2019 - Indian Institute of Science, Bangalore will conduct KVPY exam on the first Sunday of November i.e November 3, 2019. KVPY is a national level fellowship programme which is held across 99 exam cities, under three streams - SA, SX and SB, for students enrolled in classes 11, 12 and UG first year, respectively. The registrations for Kishore Vaigyanik Protsahan Yojana 2019 will begin in the second week of July, 2019 in the online mode. Candidates will be able to register for KVPY 2019 till the last week of August, 2019 and pay the application fee till the first week of September. It should be noted that candidates can do KVPY registration in the online mode only. There is no provision for offline registration. For complete details on KVPY eligibility, application form, registration, syllabus, books, preparation and more, read the article below. The selection procedure of KVPY comprises an aptitude test, followed by a personal interview for those who clear the test. The aim is to shortlist candidates having the aptitude and faculty for pursuing a research career in Science. KVPY 2019 fellowships will be granted to selected candidates only after they start pursuing approved UG courses in basic sciences. Candidates can go through the calendar below to check the important dates of KVPY 2019. This must be visited regularly to stay updated on any official announcement. SA stream - Students enrolled in class 11 can apply. Students must have scored 75% (65% for SC/ST/PWD) aggregate in Maths and science subjects. Minimum marks in class 12 should be 60% (50% for reserved categories). SX stream - Students enrolled in class 12 can apply under this stream. The minimum marks in class 10 should be 75% (65% for SC/ST/PWD) aggregate in Maths and science subjects while marks in class 12 should be a minimum of 60% (50% for reserved categories). SB stream - Those studying in UG first year can apply under this stream. Marks in class 12 should be a minimum of 60% (50% for SC/ST/PWD). Marks in UG First Year should be atleast 60% (50% for reserved categories). IISc Bangalore will release the KVPY application form in the second week of July, 2019 in the online mode. Interested candidates will be required to fill the form and submit it before the last week of August, 2019. Candidates will have to follow a series of steps like registering, filling the details, uploading documents, paying the non-refundable fee and finally submitting the form. Click on the link provided above to begin the application process. After successful registration, the login credentials will be sent via email and SMS. Login using the details. Upload photograph (in JPG/JPEG format with a file size less than 150 KB), signature (in JPG/JPEG format with a file size less than 80 KB). SC/ST and PWD candidates must also upload a scanned copy of caste certificate while PwD candidates must upload the medical certificate in PDF format (less than 300 KB). Choose four test centres in the order of preference. Preview and submit the application form of KVPY 2019. Pay the KVPY 2019 exam fee (payable via credit card/debit card/net banking). Important: Candidates are advised to check their KVPY 2019 application status with the help of their KVPY login to know if is submitted successfully. One should also take a printout of the same and keep it safe for future reference. IISc Bangalore does not prescribe KVPY syllabus as the exam aims at testing the analytical ability and understanding of candidates rather than their factual knowledge. However, students preparing for KVPY 2019 have to cover all important topics/sections which have been devised from the questions asked in the exam year after year. The sections covered in the KVPY syllabus 2019 are Physics, Chemistry, Mathematics and Biology of upto class 10, 12 and 1st year of B.Sc., B.S., B.Stat., B.Math., Int. M.Sc. or M.S., depending on the stream applied for. Thus, we can say that the KVPY 2019 syllabus includes all the topics of the above subjects covered in the NCERT books. Candidates should clear all their basic concepts first and then proceed further to problem-solving. If one is preparing for competitive exams, such as IIT JEE and NEET also, the KVPY 2019 syllabus is almost the same. One will be able to solve most of the KVPY questions. Candidates must solve KVPY previous year question papers and sample papers as much as possible. The link to the same has been provided below. Take a mock test. Taking mock tests is important as you get to know how the actual exam would be and it reduces your exam fear. When you have a few days left for the exam, revise concepts. If you have notes where you have noted down the important formulas, theorems and key terms, go through them. Candidates planning to appear for KVPY 2019 must go through the KVPY exam pattern. It familiarizes them with the paper pattern such as the number of questions, marking scheme, total marks, the medium of paper, duration and so on. While SA stream has questions from Science and Mathematics wherein attempting all questions is compulsory, SB and SX stream has two parts divided into four sections each including Physics, Biology, Chemistry and Mathematics. A student must answer three subjects in part one and two subjects in part two. A candidate may attempt more or all of the subjects. In that case best of three and two would be considered in part I and II respectively. The detailed KVPY 2019 exam pattern is provided below. The examination authority has released previous years’ question papers of KVPY in English and Hindi languages. Candidates can download the same and practise them to acquaint themselves with the the type of questions asked in the exam every year. Thorough practice of these question papers and KVPY Sample Papers will help candidates familiarise themselves with KVPY exam pattern 2019, important topics for the exam and difficulty level of the exam. Those preparing for the Kishore Vaigyanik Protsahan Yojana 2019 may refer the books listed below for better preparation of the exam. Mock Tests are model tests of the actual KVPY exam that follows the KVPY exam pattern and is bound by the time. Answers, results, and one’s rank among the other participants who have taken the same KVPY mock test previously will be shown, after submitting the test. Since KVPY 2019 is a computer-based test, the mock test allow candidates to get an idea of the exam pattern, building strategy to solve different answers etc, IISc Bangalore will release the mock test of KVPY 2019 in the second week of September. Candidates will be able to solve the KVPY 2019 mock test to practice and check how the exam will be like and get an idea of the number of questions, duration of the same. Candidates will have to complete the mock test within the stipulated time. The link for the same has been provided above. After giving a mock test, candidate’s must analyze their performance on the basis of time taken to answer the paper, the questions that took long to solve, accuracy levels etc. IISc Bangalore will release the KVPY admit card in the second week of October, 2019. Candidates who successfully register and apply for the exam will be able to download KVPY 2019 admit card by logging in and entering the requisite credentials. The admit card mentions the exam day guidelines which must be read to avoid hassles on the day of exam. Lastly, candidates must not forget to carry the admit card while appearing for the exam failing which they will not be allowed to appear for the same. The link to download the same is given above in this article. What to carry with KVPY 2019 Admit Card? Details about the exam centres are mentioned on the admit card, which candidates will be able to download online. The exam will be conducted across various KVPY exam centres in 99 exam cities in India such as Agra, Allahabad, Ambala, Bangalore, Chennai, Dehradun and Delhi among others. The table below indicates names of the states where KVPY is held. To know the complete list of KVPY 2019 exam centres, candidates can click on the link above. IISc Bangalore will release the KVPY answer key in the second week of November, 2019 in the online mode. Along with the answer key, KVPY 2019 question papers of all the three streams will also be released. The answer key carries the correct answers to all the questions asked in the exam. With the help of KVPY 2019 answer key, candidates can calculate their probable score in KVPY 2019 before the announcement of result. 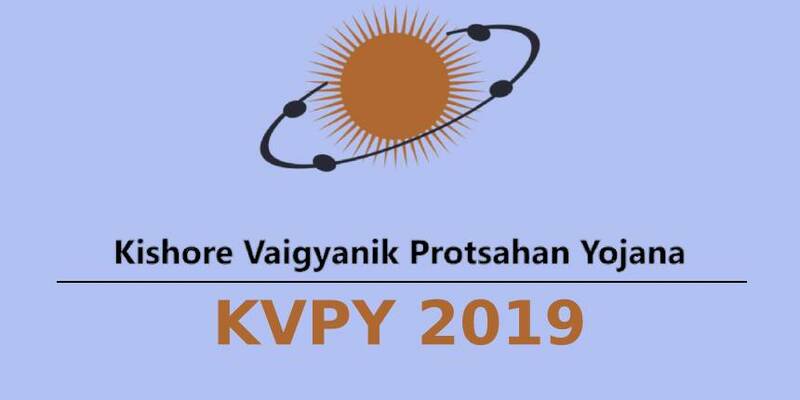 The KVPY answer key 2019 is made available online in PDF format only and candidates can download it from the link provided above. IISc sets the cutoff marks of KVPY for the final selection. The cutoff is the minimum qualifying marks set to qualify the aptitude test and personal interview of each stream. Candidates who achieve the KVPY cutoff marks of aptitude test will qualify for the round of interview. IISc Bangalore will release the final KVPY cutoff after the conduct of interview. Those who qualify in the round of interview will be awarded the KVPY 2019 fellowship. Separate cutoff of KVPY 2019 is released for each stream and category. Caste certificate. Only for SC/ST candidates. Should be issued by the Competent Authority. Study certificate form. It should be obtained from the Principal/Head of the Institution where one is currently pursuing studies. SA/SX/SB- during 1st to 3rd years of - B.Sc./B.S./B.Stat./B.Math. / Integrated M.Sc. /M.S. Q. Who do I contact in case I have any KVPY examination centre related queries? A: Students can send their queries through email to [email protected] (for application related queries) and [email protected] (for fellowship-related queries). Q. What are the examination timings of KVPY 2019? A: KVPY 2019 for Stream SA will be held from 9:30 am to 12:30 pm and that for stream SB/SX will be conducted from 2 pm to 5 pm. Candidates should report to their allotted exam centre before 1 hour. Q. What is the syllabus of KVPY 2019? A: IISc Bangalore does not prescribe any specific syllabus for the aptitude test. Students will be evaluated on the basis of their understanding and analytical ability. However, there will be questions from the syllabus up to class X/XII/ UG first year as applicable. Q. Will I be allowed to carry the calculator in KVPY examination hall? A: No, calculators or any electronic devices are not permitted. You can use Virtual calculators which will be made available on the computer screen. Q. Can KVPY 2019 be attempted in Hindi Language? A:Yes, you can attempt the KVPY 2019 exam in either English or Hindi Language. Q. If I already have been awarded with another scholarship, can I avail the KVPY Fellowship? A: No. KVPY scholarship cannot be availed along with another fellowship /scholarship, be it government or private. In order to avail KVPY 2019 fellowship, students will have to relinquish any other fellowship or scholarship that they are in receipt of.